This is the funnest and brightest wreath I have ever made and.........I love it! It's made with an 18 inch wire wreath frame and 72 painted clothespins. The clothespins didn't even have to be glued to the frame, you just clip them on. Cool! It took me hours to paint all those clothespins, but it was worth it. It's supposed to be a Thankful Wreath for Thanksgiving. 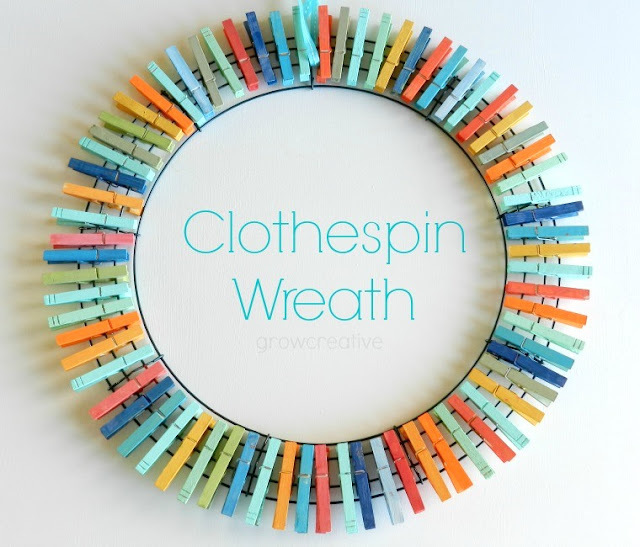 You can clip pictures of things you are grateful onto the clothespins in the center of the wreath, but I kinda like it how it is... just colorful clothespins on my wall. It livens up my dining room for sure! wow you think of the coolest things! I love this. I looks so good! Cute and fun. I wonder if you could drop the clothespins in different colored dye baths (like Rit dye) for a quicker project. It turned out cute and I love the colors you chose. We had some interesting colors picked last weekend. I'm in love with this... Just gorgeous. All the colors look beautiful together! Saw this on sugar bee crafts.. awesome. Hi! I think this is a really cool wreath! But Bethany Mota posted a DIY video on YouTube showing how to make one too, even though its slightly different, both of your wreaths are really cool too! Is it okay if I suggest you watch her video? She has alot of cool and interesting DIYs for the holidays, anyway, thanks for your post!